Joe has been playing percussion for thirteen years. He studied under Scott Prebys at the University of Mary in Bismarck, North Dakota. He has done numerous studio and touring dates with artists such as Grammy Winning Joseph Firecrow, Andy Vasquez, Annie Humphrey, and many others. Joe was the main studio drummer/percussionist at Makoche Recording Studios for the past four years. 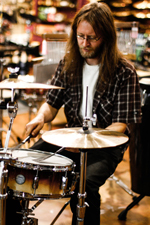 He has studied with and/or performed with drummers such as Gregg Bissonette, Dave Weckl, Ruben Alvarez, Terry Bozzio, Brad Stockert, and others. Joe has been teaching since 2001, and he teaches students of all levels, ages and styles on instruments ranging from drum-set, Latin percussion, mallets, world percussion, snare drum, and classical percussion. If you have a question for Joe, or wish to contact him, please fill out the form below. The message will be passed along to the Education Center and they will get back to you.